← U.S. Open Golf ala 2012. Orchestra rehearsal in the morning – Strauss Alpine Symphony and a rehearsal of Catulli Carmina in the afternoon. Bill Cahn came up to the farm after Catulli for supper and to spend the night. The first game of the World Series was rained out so everyone watched “The Tycoon” with Anthony Quinn. We took some cheese into the living room and opened this bottle which Bill had bought in Rochester. What a bouquet! I wish I had a vocabulary descriptive enough to satisfy my experiences with smell. So earthy and rich but there was much, much more to come. Each sip was different and over a two hour period of sniffing and tasting, the wine began to die. But what a slow and dignified death it was. We quaffed the last as its bouquet began to vaporize into the night air. This is the first time I have experienced this with a wine. The next morning (October 11) Bruce [1.] 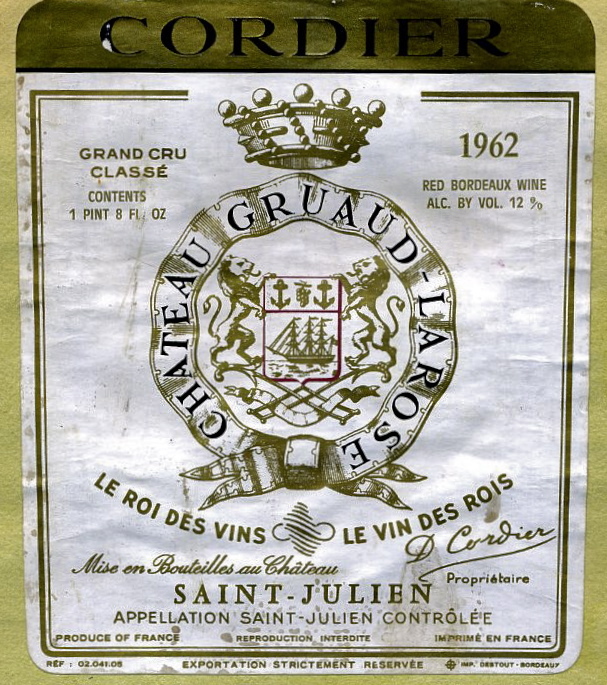 showed us his list of collected Medocs and he has some of this wine from 1928. Later Bill and I listened to an Ottawa Nexus concert. [1.] Bruce Mather, distinguished Canadian composer, oenophile and member of the Burgundian wine fraternity, le Confrérie des Chevaliers du Tastevin – Brotherhood of Knights of Wine-Tasting Cups , is a good friend and has composed many works for Nexus and members of Nexus, all named after great French or Italian wines. le Confrérie des Chevaliers du Tastevin is headquartered in the twelfth-century Château du Clos de Vougeot in the Côte d’Or region of France. Bruce maintains wine cellars in Montreal and in Saint Lin Réffanes, France. 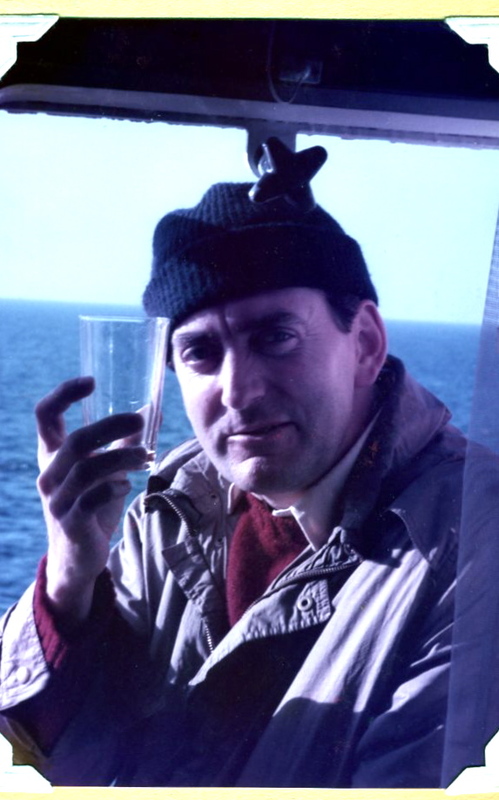 1984 – Bill Cahn on the North Sea, en route to Newcastle, says “prosit” in our cabin window with a splash of Finland’s Laponia Bramble berry liquor.